A team of astronomers and engineers want to reproduce the atmosphere of a red giant like the one you are seeing in this Hubble image—right here on Earth. To make this happen, project Nanocosmos will build three five-meter-long machines working with hydrogen, carbon, nitrogen, oxygen, silicon, titanium, iron and other metals at 1500 C (2732 F). 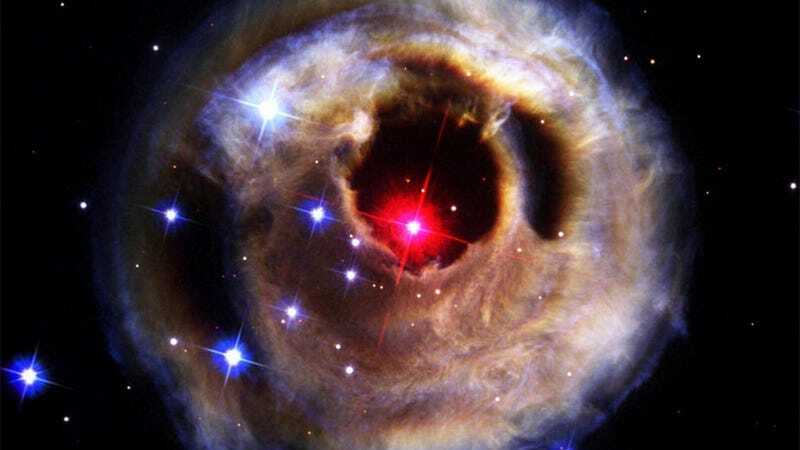 For the first time, Nanocosmos will design and build a machine capable of producing insterstellar dust grains emulating the physical and chemical conditions of the outer layers of dying stars. In a manner of speaking, we want to bring a star to the laboratory. Obviously, it's a very complicated object. We are not going to reproduce the star itself but only its atmosphere, the place where interstellar dust is formed. How can we do this? By building simulation chambers, two in Spain and one in France, to study the different physical and chemical processes that make these small particles of interstellar dust. The dust grains that form around dying stars (red giants, planetary nebulas, and supernovas) are ejected to the interstellar medium where, after millions of years, they mix in new interstellar clouds that give birth to stars and planets, some rocky like Earth. We know their composition but not their structure or the fundamental process that form them. The project will employ 40 engineers and astronomers throughout the world, as well as the ALMA telescope in Chile and various radio telescopes around the world.